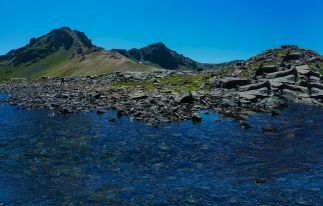 Looking the best bars and pubs in Yerevan? You are on the right way. The capital’s bars and pubs will be an excellent alternative for leisure activities with friends, especially if you have had enough of “spiritual food” and are looking for entertainment. Let’s examine the best bars and pubs in Yerevan! We have already shared with you an article about Nightlife in Yerevan, in which we spoke mainly about nightclubs. 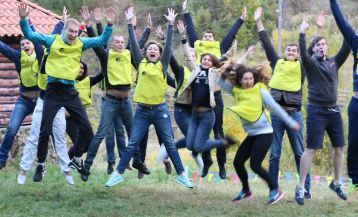 In this article, we focus your attention on the bars and pubs, which in recent years have become so popular among the young and middle-aged people in Yerevan. Pub culture has recently come to Yerevan from Europe and, fortunately, has successfully got accustomed removing from its path cheap karaoke clubs and other places, vaguely reminiscent of the real “club” concept. The youngsters are looking forward to “Friday night hangouts”, throwing off all the heavy work load and to plunging into the fun! 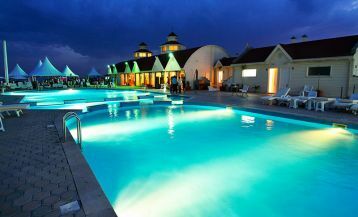 Yerevan, of course is far from London or Berlin in quantity and quality of bars and pubs, but even in the Armenian capital it is possible to find several decent places for an evening leisure. What distinguishes Yerevan pubs from European is a warm atmosphere, always friendly welcome (especially if you are a tourist! ), quality music and delicious cuisine. 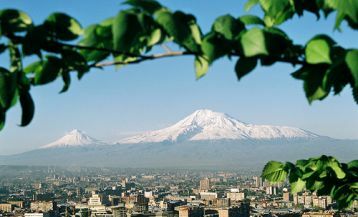 In addition, it should be noted that Yerevan is one of the safest cities in Europe: the streets, even in the evenings are always crowded and bustling, especially during the warmer seasons. In Yerevan, bars are divided into 3 main categories: always lively pubs, where the menu is dominated by mostly beer and a variety of cocktails, lounge bars and sophisticated wineries for the lovers of wine and continental cuisine. Pubs often host concerts of local rock bands and organize themed parties. The atmosphere in pubs is very relaxed and comfortable, and the unique interior much contributes to it: everything from ethno style to thrash. Lounge bars feature a classic, restrained decor and are suitable for more relaxing pastime. Wineries are extremely popular not only among tourists but also among locals. 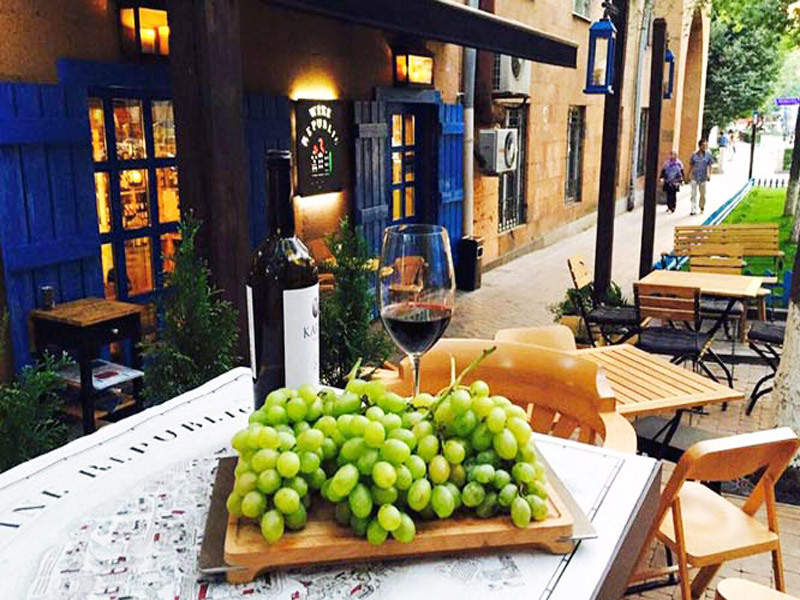 In the summer, it is almost impossible to find a free table on the street because everyone wants to spend the evening enjoying a delicious glass of wine in the fresh air. Below, we offer detailed information and contacts of pubs and bars, which in our opinion should definitely be visited during your trip to Yerevan! We can confidently assert that Hemingway’s pub has become a cult place for the youth of Yerevan. Hemingway’s attracts visitors with its unique atmosphere. The pub interior is made in retro-style, with bookshelves and portraits of the great writer, whose creativity has been inspiring more than one generation of young people. Hemingway’s is located in the busiest part of the city-at Cascade, on the left from Tamanyan monument. Hemingway’s serves a variety of cocktails and beers, as well as offers a snack bar. Do you want to feel like in Ireland? 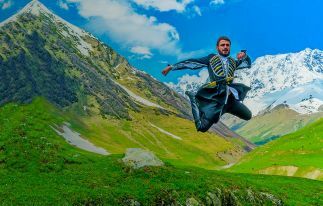 Then you should undoubtedly visit this place. The name of the pub already speaks for itself: it is possible to enjoy a mug of beer accompanied by Beatles or the Rolling Stones. The interior of the pub is similar to the Irish style: old-fashioned wooden furniture and all painted in green. 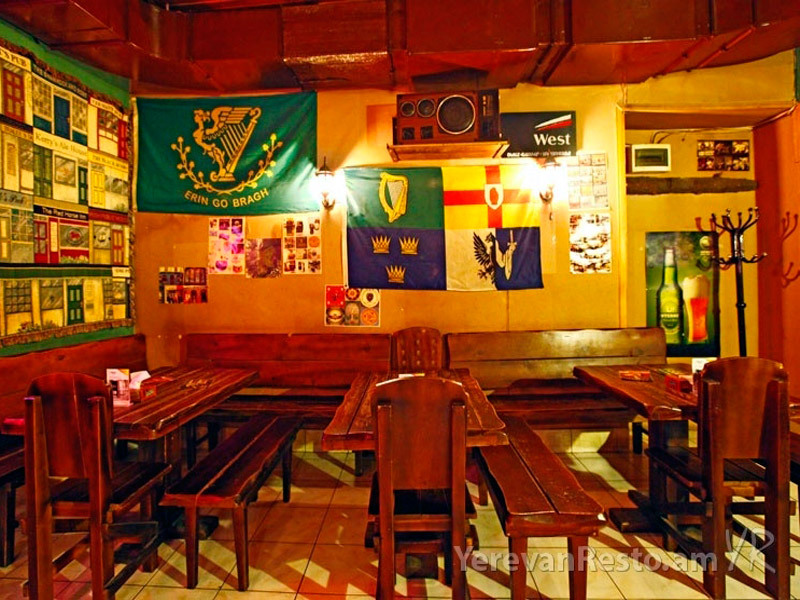 The Irish pub likes to gather under its roof the football fans, organizes live concerts or just throws parties. Well, where else if not here, you can try the legendary Irish beer Guinness? Perhaps, Dargett is slightly different from the general concept of bars or pubs, but we could not help but mention this perfect place in our list. Dargett brewery is a unique place, where everything from the service to the menu is at the top level. Dargett is a brewery that serves only craft beer made from high-quality raw materials in the best traditions of the Armenian brewing. Beer menu is exceptionally rich: you can try everything from ale to apricot or citrus beer. The cuisine is continental. Plus, the prices will pleasantly surprise you. We believe that the true beer lovers will appreciate this place. 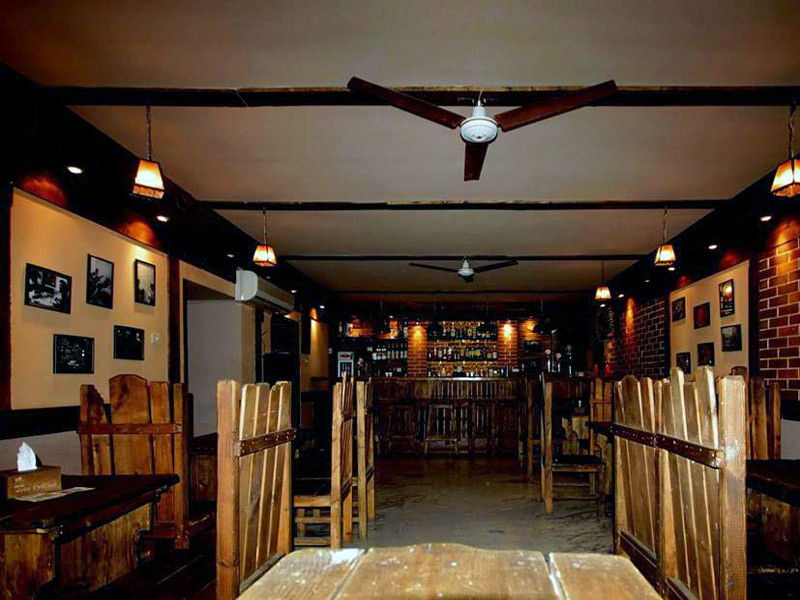 One of the best of Yerevan pubs, where the good music and fun atmosphere always prevail. Tom Collins offers a variety of cocktails, beer, and tasty cuisine. Tuesday is announced the day of chicken wings, and on Thursdays you can order an unlimited amount of crayfish. Armenia and wine are inseparable. It was on this sacred land that biblical Noah planted the first vine. Archaeological excavations in the caves of Areni have proved that Armenian people had the knowledge of winemaking as long 6 500 years ago! Today, the country’s wine industry continues to develop and flourish. Below we present the best wine bars in the capital! In Vino is literally saturated with the philosophy of wine. Here are collected the best wines from all over the world, and of course, the best assortment of Armenian wines. All conditions have been created for the careful storage of wine: temperature, humidity, and light. It is worth noting that inside it is fully non-smoking, but tobacco lovers can enjoy wine on the outdoor veranda. In Vino offers wide range of cheeses and meat products. Average bill ranges at about 5000 AMD. This cozy wine bar is located right on the Cascade and resembles a small cafe in the Parisian style. It is always crowded, especially in the summer in the open veranda part. 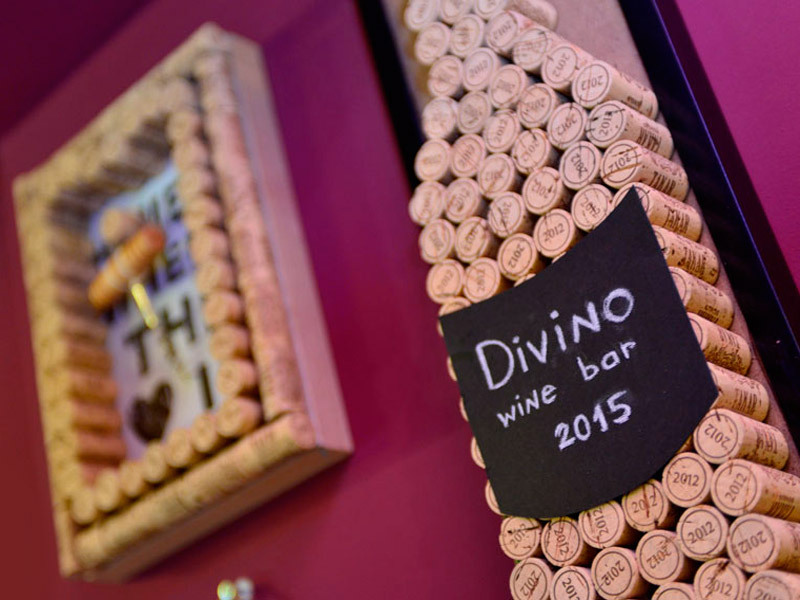 Inside Divino is decorated with various wine bottles. Simple but elegant! There is also a rich selection of wines, cheeses and a variety of snacks with affordable prices. The Wine Republic is literally the place of wine worship. It has developed its own culture of wine, wine drinking and wine worshipping. 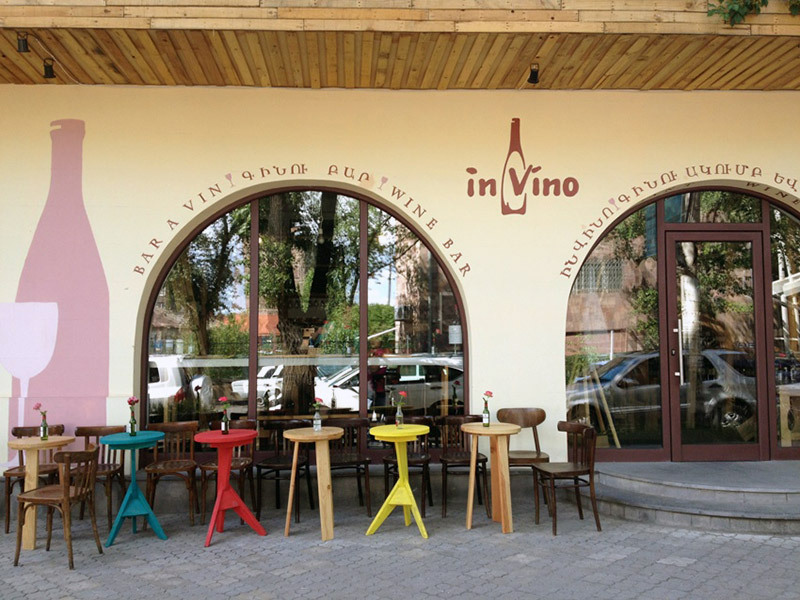 The motto of the institution is “Drink wine and dine – live happily ever after.” The Wine Republic regularly hosts wine tastings, seminars on various wines and on Armenian winemaking history in particular. It is worth noting that the prices are much more expensive than in other wineries: the average bill starts at 5000 – 10 000 AMD. But the service, menu and great atmosphere fully justify the high cost!